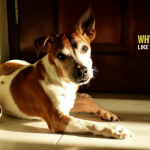 You are here: Home / Why Do Dogs / Why Do Dogs Stick Their Heads Out Car Windows? When was the last time you saw a dog with his head out the car window looking sad? Unless it was a St. Bernard chances are probably never (they always look sort of sad, don’t they?). Why do dogs stick their heads out car windows, and why do they love it so much? I’ve yet to own a dog that doesn’t love sticking his head out the window. It’s a great way to take in a ton of sights, sounds, and smells. For many dogs the opportunity to get out and experience some of that outside world, even from a car window, is pretty exciting. Laika absolutely loves having her head out the window, and she loves it even more when she gets to “speak” to another doggie outside. I’ve been working on getting her to use her polite indoor voice as we pass other dogs, but it’s not quite fool proof yet. Most of our dogs spend the majority of their time indoors, so when they get the chance to go out and see some so much of the outside world they can get pretty giddy. 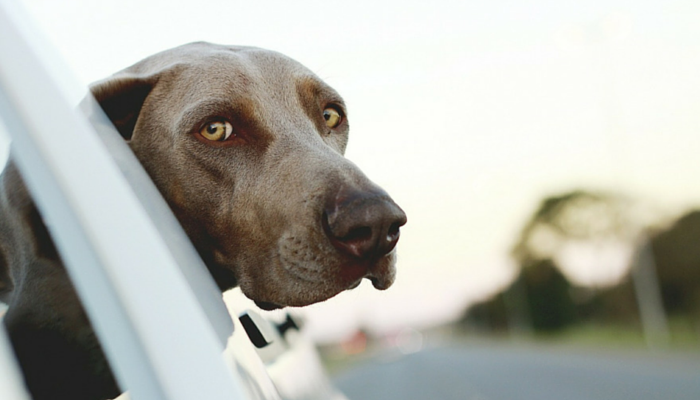 What dog doesn’t respond to “wanna go for a ride?” Jumping in the car, regardless of destination, is a sensory overload for our canine companions. I imagine for our dogs a ride in the car is just as exciting as when we go to a carnival. Being surrounded by all those sights, sounds, and smells can be quite stimulating, regardless of whether you go on any of those rides. The atmosphere itself is exciting and memorable. Since dogs take in so much information about their surroundings via their nose all those outside odors become quite enticing. Dogs not only pick up a ton of different odors with that awesome nose of theirs, they also have an organ called the vomeronasal organ (also known as Jacobson’s organ) that lets them sniff our pheromones. Dogs are able to keep their odor detection & pheromone molecule analysis separate. The vomeronasal organ has it’s own set of nerves leading to the dogs brain that’s solely dedicated to interpreting those pheromone signals. Imagine how much information your dog is able to take in, just by having his head out the window. The faster you’re going the more your dog can pick up about the outside world. It’s estimated that dogs can detect some odors in parts per trillion. They posses up to 300 million olfactory receptors in their noses, compared to about six million in us. And the part of their brain that is dedicated to analyzing smells is roughly 40 times greater than our own. As with so many other enjoyable things in life there’s a lot of potential dangers when you allow your dog to hang his head out the window. Have you ever had your windshield chipped by a small pebble? Imagine what that would be like hitting your dog while his head is out of the car window. When your dogs head is hanging out the window he’s susceptible to getting hit with any of those rocks or dust your car kicks up. If any of that debris hits your dog in the eye it can lead to serious injury. Ear damage is another concern. Dogs that hang their heads out of car windows are at risk for developing ear infections from any wind blown particles or by the wind itself blowing directly into their ears. 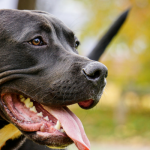 The constant flapping of a dogs ears can cause the ear flaps to swell, and repeated trauma to the ears can cause scar tissue to form inside the soft tissue of his ears. 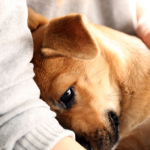 Trauma to the ears can cause permanent damage and leave a dog with lifelong ear problems. If there was another dog or squirrel on the side of the road would your dog try to jump out the window? Some dogs certainly will, and even at slow speeds jumping out of a moving car can cause serious injuries. It’s recommended to have you dog restrained in the car if you’re going above 25 mph. With an unrestrained dog the faster you’re going the higher the potential danger. A few basic safety tips for riding in the car with your dog. Do You Let Your Dog Stick His Head Out of Car Windows? I’ll be the first to admit I let Laika stick her head out of the car window, but only around our neighborhood where we drive pretty slow. I never roll the window all the way down either, it’s not worth the risk of her jumping out. Laika loves our little trips around the neighborhood, and as long as she’s not shouting at every stupid squirrel we pass I don’t mind at all. Is your dog allowed to stick his head out your car windows? Have you ever had a dog jump out? Does your dog like to bark at every moving thing you pass? Why Do Dogs Feet Smell Like Fritos? Why Do Dogs Have Belly Buttons? Why Do Dogs Love to Lay In The Sun? 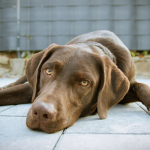 Why Do Dogs Take So Long to Poop? Great post. I think our dogs love the scenery and smells in our rural town; we’re always passing farms. We have screens to keep our dogs head in the car. I worry about rocks kicked up from the road. My windshield is always getting chips and cracks. That’s the scary part – seeing what a simple pebble can do to glass, I don’t want to know what that would be like hitting anyone in the face. Mom goes nuts when she sees dogs with heads out the windows. The wind is also bad for our eyes! We are in the car at all times with our seat belts fastened. When we ride in a convertible, we are also belted in and we wear doggles. It is so very dangerous to let heads hang out, no sane person lets human kids do it! My sister Katie, when she was young and wild actually saw her dog friend and jumped out of the moving convertible, but her seat belt held her tight and had her half dangling off the side of the car. Luckily they were moving slow, but imagine if she had not been strapped in! Nala loves to stick her head out the window when we drive–and I love the face she makes, her eyes squinty, ears slightly back, and nostrils huffing. Of course, we also only do it on roads where we can drive fairly slowly. I had no idea that the faster moving air meant that she can smell more, but it makes a lot of sense! Great post! I actually don’t allow mine to stick their heads out. Most of the time they don’t want to and just curl up in the back seat anyways. We always leave the windows cracked part of the way so Phoenix can have air and not get car sick but not enough to where they can stick their heads completely out. My husband’s family dog nearly jumped out of the car as his mom was driving once to get a squirrel, luckily my MIL was able to grab her by the collar and she wasn’t going very fast but it was scary enough that we all learned our lesson that day. That’s so scary about your husbands families dog – such a close call. I honestly don’t know if Laika would try to jump out or not, but I’m not willing to take the chance. I don’t let Haley put her head out the window but she loves to sniff the air coming through the sunroof. My mom’s cousin was driving on the interstate once when their dog tried to jump out of the back window. She was in the front passenger seat and was able grab the dog by the back leg to keep it from jumping all way out. I guess I always remember that story so I never leave the windows down enough that Haley can stick her head out or jump. Great tips to remember and I like your image/infographic! That would have given me such a panic attack, I couldn’t even imagine what would happen on an interstate. My dogs love the cornucopia of smells when we go for car rides. They go back and forth between windows to get the different scents. It’s one of their greatest joys. They absolutely love all those smells, don’t they? I love seeing my dog smiling as she’s taking in all the smells of the neighborhood. I’m kind of freaked out about cars driving by, so I don’t let Ace stick his head out the window. However, I crack it enough so he can get his nose out the window. He loves to stick his nose out, especially if we’re going somewhere “exciting” like a park or the beach. Good points in this post. I don’t think all dog owners are aware of the potential for a rock to hit the dog in the eye, etc. I haven’t seen one in quite a while. Maybe the dogs should wear little motorcycle helmets to protect their eyes and ears.